Halton residents have one of the highest standards of living in Canada and a large part of that is because of Halton Region’s commitment to being well planned. Halton’s dedication to planning complete and vibrant communities helps make Halton a great place to live and to support that, the Region is creating a plan that will impact how people move around the Region to the year 2031. 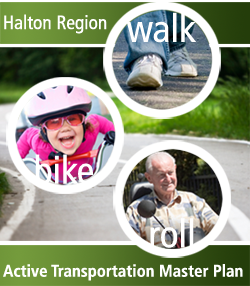 By creating a 20-year vision for active transportation across Halton, the first Regional Active Transportation Master Plan will make it easier to walk, bike and roll across Halton. The plan will give us a strategy for infrastructure like bike lanes and multi-use paths, as well as initiatives and programs for active transportation to promote people-powered travel throughout the Region. The plan will help improve connections within and between the Local Municipalities and offer easier access to sustainable transportation choices. By looking at our existing infrastructure, identifying ways to improve it, looking at different opportunities and working with residents, we’ll be able to show what the best possible active transportation system will look like up the year 2031. 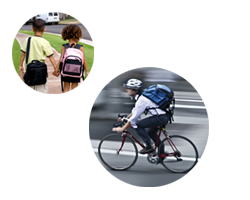 Some of the Active Transportation Master Plan highlights include developing cycling and walking networks, active transportation tools (like a map or trip planner), as well as promoting cycling and pedestrian safety. As a Regional Government, we want to design a network of safe, well-connected and convenient routes and to integrate these into the community. This will help us to provide facilities that will give people greater choice in how they travel throughout our Region and help encourage physical activity. Throughout the planning process, we’ve met with various stakeholder groups, our Local Municipal partners, residents and others to ensure we create a plan that works for all of us. Working together is critical and reflective of our commitment to being resident focused. We would like to hear from you because together, we can plan for a great Halton where it’s easier to walk, bike and roll across the Region. Please visit our website at www.halton.ca/activetransportation to fill out an online feedback form; email us at activetransportation@halton.ca; or dial 311 to share your feedback.